It's the question on everybody's mind, after a midterm election which positively devastated the Democratic Party's congressional numbers — what will the last two years of the Obama era look like, given a hostile House and Senate, and a slate of Obama's stated priorities now hanging in peril? Well, if you've been watching much Fox News lately, there's one possibility you may have heard — could the Republicans actually impeach President Obama? It's a question that's been kicked around quite a bit this year, first over the summer, when White House adviser Dan Pfieffer suggested that Obama's plans for an executive order on immigration could spur the GOP to launch impeachment proceedings. At the time, the suggestion was rebuffed by Republican leadership, in particular Speaker John Boehner, who denied any plans or desire to do so. However, Boehner is rather famously ineffective at controlling his membership in the House, so the question still looms large. As MSNBC's Steve Benen notes, Fox News personality Charles Krauthammer may be indicative of this possibility — prior to the midterm elections, impeachment was just a deflection for Krauthammer, and one which needlessly "energizes Democrats." Now, however, which a new Republican Congress in waiting, the tone gets more dire. Krauthammer called Obama's expected executive order on immigration "an impeachable offense," although he admits it may be a bit late in the game. So, could this actually happen? Luckily for the Democrats, the answer is probably not — and here are a few reasons why. It's possible that you're a little rusty on your rules of impeachment. After all, it hasn't happened since... 1999? Huh, that seems a little recent. Anyways, here's the first thing to remember: impeachment and being kicked out of office are two different things. Impeachment is the process that precedes being kicked out — former President Richard Nixon resigned to avert impeachment, while former President Bill Clinton actually was impeached, but survived the process. Here's what would need to happen for Obama to be both impeached, and thrown out of the White House. The House of Representatives would have to bring charges against Obama, detailing what exactly he's done to make impeachment a proper course of action. First, the House Judiciary Committee would determine if impeachable offenses exist, then a simple majority vote could send those charges along to the Senate for consideration. With the House's 33-vote GOP majority, this seems at least possible, assuming Boehner comes around to the idea, or his membership bucks his desires. The Senate would then have to vote on whether to remove Obama from office on the strength of the articles of impeachment delivered by the House. The entire affair plays out more or less like a trial on the Senate floor, following which the entire body must vote to decide whether to boot out the President. Here, however, is the last, strongest line of defense for the Democrats. The Senate must vote in a two-thirds supermajority to convict the President, a whopping 67 votes. With the Senate's post-midterm composition still boasting 44 Democratic seats, the road to 67 is a long and hard one — at least 11 Democrats (or nine Democrats along with two Independents) would have to flip. Setting aside procedure, there's be another big elephant in the room (ahem, no pun intended) when it comes to any GOP impeachment aspirations — who's willing to go front-and-center voting to kick out Obama, and risk their future political career if the tide turns against them? After all, in the modern political era this has happened precisely twice: first, to Richard Nixon, who basically all fair political observers agree would have — and should have — been impeached had he not resigned beforehand. And second, to Bill Clinton, who survived the final Senate vote, with just 50 senators voting "guilty" on a charge of obstruction of justice, and 45 voting "guilty" for perjury. It goes without saying that a vote in an impeachment proceeding can be a career-definer, and however many Republican senators might ideologically be on board, the costs of having such a vote on their record could come back to bite them if public opinion turns in Obama's favor. As it stands now, if the GOP impeached Obama, regardless of whether it was successful (which it almost certainly would not be), they'd risk earning a title no political party wants — that of the hysterical and childish sore loser. It would look especially bad, considering that for all former President George W. Bush's dismal approval ratings and highly controversial decisions, the Democratic Congress never actually took the impeachment plunge, while the last two Democratic Presidents would've been impeached by the GOP late in their terms. 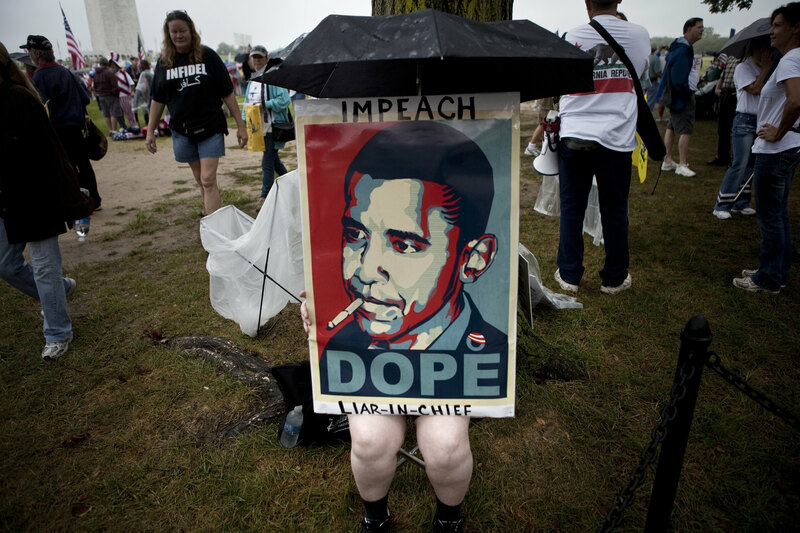 Basically, to try to impeach Obama is to risk a party-wide image of venality and bad-faith aggression. It could easily make it seem as though the Republicans, the self-appointed "adult" party, simply can't tolerate a Democrat in the White House — at least, not long enough to get through a two-term administration. That's a reputation, it seems safe to say, that the Republicans might like to avoid.